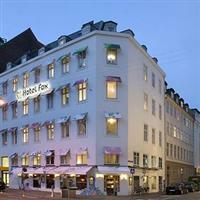 Located across the road from Orstedsparken, one of Copenhagen's finest parks, the Fox Hotel is only a few minutes walk from the City Hall Square, Tivoli Gardens and the Central Station. Strogot, the main pedestrian street, is approximately five minutes on foot and cafes, bars and restaurants can then be found in abundance. This is a very unique boutique modern hotel, ideal for many guests and is very well located in the very heart of the city. Amenities are good, service is friendly, rooms are large and unique as each being decorated in a different theme. This is a very good base from which to explore the history, culture, restaurants and nightlife of Denmark's capital city. Highly recommended. This is an attractive large modern building. Rooms are large in size and each room is individually decorated in a different unique theme making this a one of a kind modern boutique hotel in Copenhagen. Please note there are no twin rooms (two seperate beds). The hotel restaurant serves a good buffet breakfast. The modern lobby is large with a seating area for guests to check in with comfort and ease. 11 kms to the nearest airport (copenhagen), 2 minute walk to the nearest bus stop, 7 km to the nearest fair site (bella centre), Close to the station (copenhagen main station).